The HPF, located at McDonald Observatory at the University of Texas at Austin, targets low-mass planets around cool nearby M dwarf stars in Habitable Zones, regions where liquid water might exist on a planet’s surface. M dwarf stars are known to host rocky planets, but these stars are faint due to their size and their magnetic activity manifests as spots and flares, which pose problems for existing visible light instruments. The HPF, coupled to the 10-meter Hobby Eberly Telescope, instead uses near-infrared light—a type of invisible infrared light closest in wavelength to the visible spectrum—to observe these stars at wavelengths where they are brighter and less active. “Detecting near-infrared wavelengths also poses tremendous technical challenges,” said Mahadevan. For example, the instrument is so sensitive to infrared light that heat emitted at room-temperature blinds the detector, requiring operations at very cold temperatures. The HPF was designed to overcome these challenges, and also offers an extremely high level of control over temperature and pressure—essential to proper functioning of the instrument. 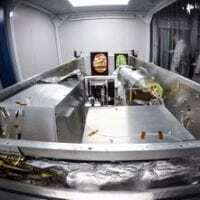 The Habitable Zone Planet Finder and its frequency comb calibration system were built with support from the US National Science Foundation’s Major Research Instrumentation and Advanced Technology & Instrumentation programs, Penn State, and the National Institute of Standards and Technology. Ongoing analysis of data is supported by a grant from the Heising-Simons Foundation. The Hobby-Eberly Telescope is a partnership between The University of Texas at Austin, Penn State, and two German institutions, Georg-August-Universität Göttingen and Ludwig-Maximilians-Universität München. A publicly accessible discussion of this result can also be found on the HPF blog hpf.psu.edu.